NV HMI By Omron is also Capable of Communicating with Mitsubishi MELSEC-FX1N Series , MELSEC-FX2N/FX3U/FX3UC Series and MELSEC-Q Series. In our earlier Posts we saw the step by step procedure for Communication of NV HMI with Allen Bradley , Siemens S7-200 PLC and Modbus Communication of NV HMI. Note:- Short the Terminals 7 and 8 at the HMI Side. Also the Connection of Mitsubishi FX1N PLC is also Possible using the RS232 via the Mitsubishi PLC Adapter with NV HMI. See the Below Connection Diagram. Note:- Also make sure to short the PIN 1 and 5 at the PLC adapter side. After making the connections as stated above as per RS232 or RS485 we just have to make some settings in NV HMI software and PLC Programming Software. Open the NV Designer Software and Create a New Project and select the proper NV HMI Model which you are using and after that in PLC Type select "Mitsubishi MELSEC-FX Series" and then click Next and select System Memory Area accordingly. See the Below Picture for better Understanding. Note:- Click on the Picture for a Better Clear View. 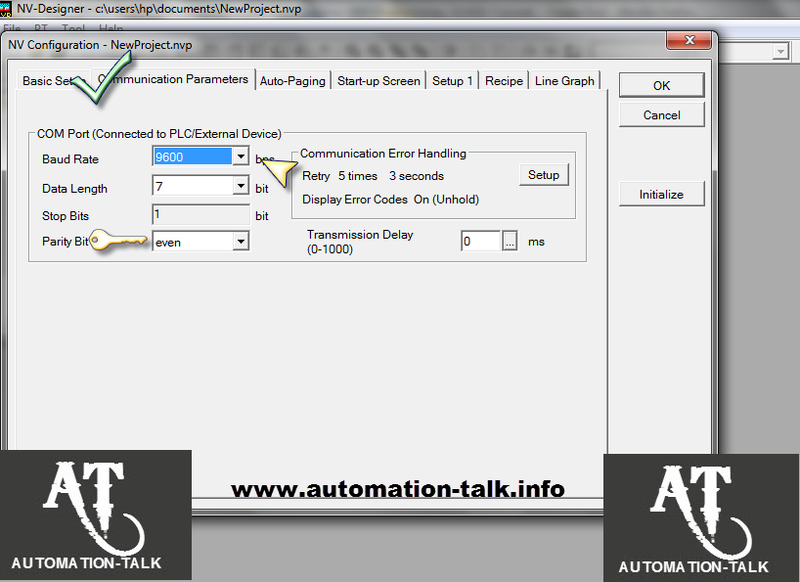 Now we have to define Communication Parameters Both at HMI and PLC side. To set the Communication Parameters in the NV Designer go to PT----NV Configuration and under Communication Parameter Tab select baud Rate as 9600Kbps , Data Bit as 7 , Stop Bit 1 and Parity as Even. See the below Picture for better Understanding. Now we have Done all the Necessary Settings Required for Communication of NV HMI with Mitsubishi MELSEC-FX1N PLC. Now You can make the HMI Screens as per yours Application and you will be able to access all the Bit Devices and Word Devices of the PLC. If still you face any problem then you can write in Comment section. We will soon be posting for connection of NV HMI with other Mitsubishi PLC like MELSEC-FX2N/FX3U/FX3UC Series, MELSEC-Q Series and MELSEC-Q and A (CPU). Till then you can subscribe to get all updates in Yours Inbox.Subscribe to Automation-Talk by Email.